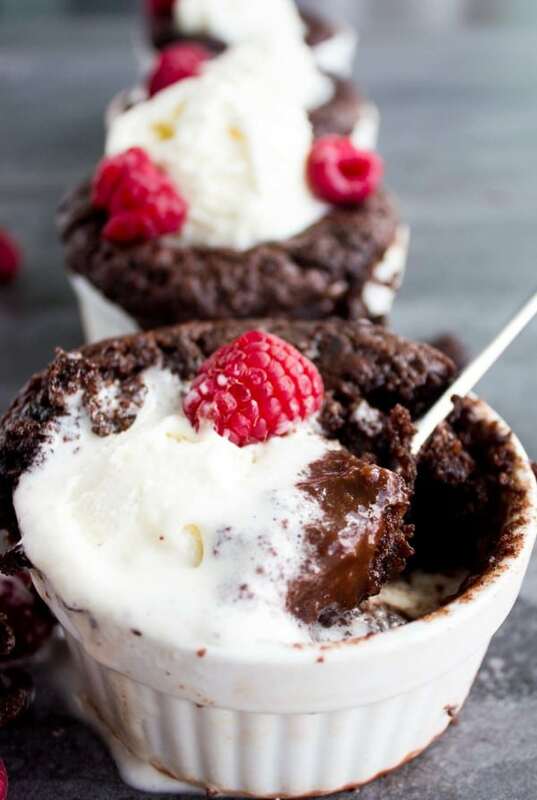 These individual Self-Saucing Mini Chocolate Pudding Cakes are the perfect quick and easy dessert for guests! As they bake, the cake batter rises to the top creating layers of moist cake and saucy intense chocolate pudding! The ultimate chocolate cake and pudding all in one. This mini chocolate pudding cake recipe is a chocolate lover’s dream: a layer of saucy chocolate pudding at the bottom that is topped with a tender chocolate cake. Rich, satisfying, very chocolatey yet incredibly light and all ready to enjoy in half an hour! This will be your absolute go-to chocolate dessert from now on. Well before we get into this show-stopping chocolate pudding cake, I have to admit that I was never a chocoholic when I was young. I know, some may judge me already and I might regret admitting this one day, but bear with me because now I am a die-hard chocolate person! But that comes with a strong condition, one I never skimp on—I am a die-hard chocolate person for really good (and I have to stress on the “good” ) chocolate. With that being established, I can openly say, these Chocolate Pudding Cakes are the perfect chocolate dessert! I can’t count how many times I made them last minute when someone shows up unannounced or when I am visiting a friend and want to bring a treat. These Chocolate Pudding Cakes are intensely chocolatey, yet surprisingly light and prepared in 15 minutes. They’re delicious eaten warm or cold, and the pudding layer at the bottom is made from scratch, but not by you but by some magic that happens once you combine the chocolate batter and some hot water in the oven, so no extra steps here. 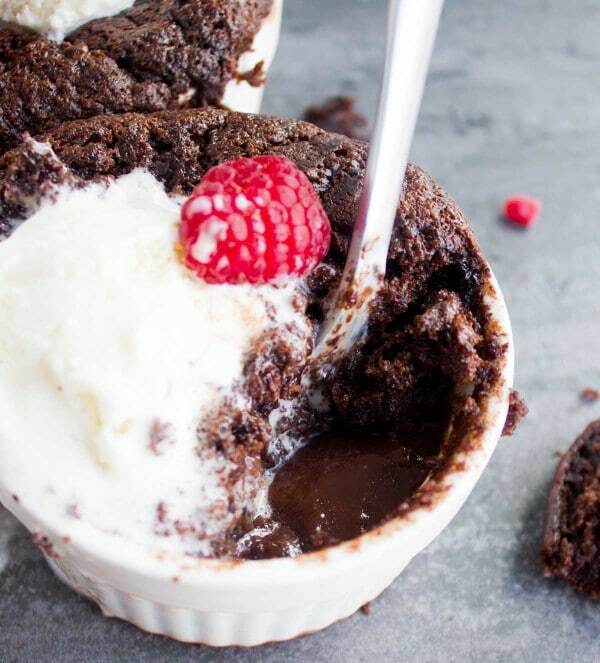 Chocolate Pudding Cakes are the perfect dinner party dessert and I love to serve them warm with some ice cream and berries ( aka my girls’ favorite way!) or ice cream and my homemade caramel sauce ( aka. my moms’ favorite way!). Here’s how amazingly easy and this recipe comes together. The cake batter comes together in 5 minutes. 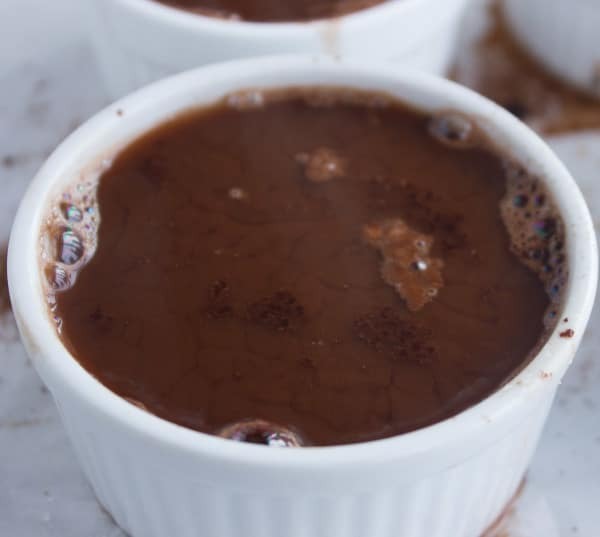 Pour it into the ramekins and sprinkle with a sugar-cocoa mixture. No mixing required. Then, we pour some boiling hot water over that chocolate mixture – again, no mixing. So it’s a separate cake layer a cocoa layer and a hot water layer, but when baked, the sugar-cocoa mixture and the hot water thicken up into a silky smooth and thick chocolate pudding that sinks all the way to the bottom of the pan. The chocolate cake (since it contains baking powder) will rise to the top and bake beautifully into a tender, moist and light cake. I love making them in individual or mini size cakes because they cook faster, and are a perfect serving size. Alternatively, you can make your chocolate pudding cake in a 2-quart baking dish. Simply double the recipe for a bigger crowd. 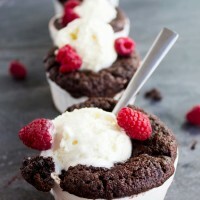 These mini chocolate pudding cakes have satisfied the pickiest chocoholics I’ve met ! Give this easy chocolate dessert a try and enjoy the ultimate chocolate moment. 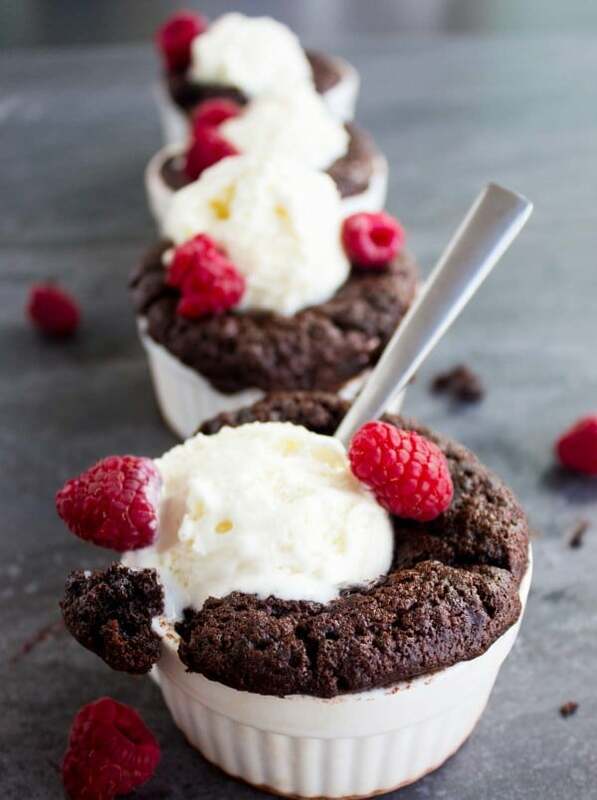 You can make these Self-Saucing Mini Chocolate Pudding Cakes in 4 individual ramekins or in a big casserole dish, doubling the recipe. 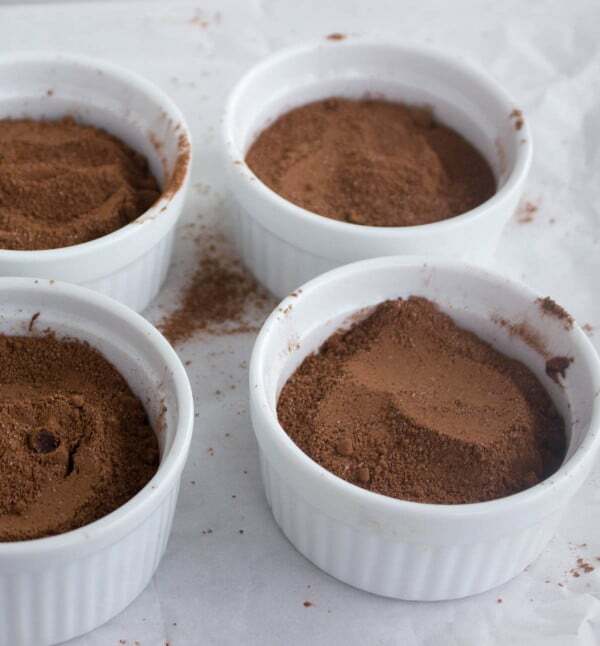 For best results, use high-quality cocoa powder and chocolate chips! The mix of light brown and granulated white sugar makes for a rounder more caramelized flavour. 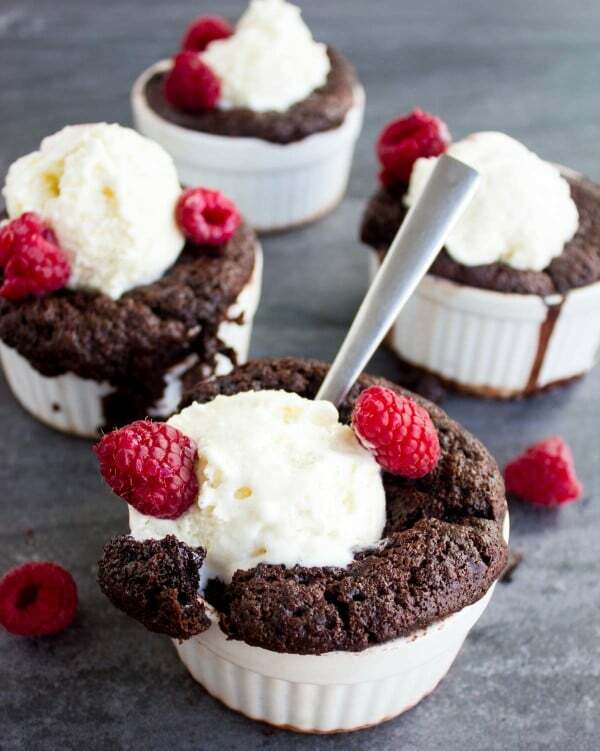 You can serve these Mini Pudding Cakes with whipped cream, but my suggestions are vanilla ice cream, fresh berries and a drizzle of homemade caramel sauce. Preheat the oven to 400 degrees F. Place 4 ramekins ( 6 oz.each) on a baking sheet ( no need to grease them). Mix the topping ingredients in a separate bowl and set them aside. Prepare the cake: Place the chocolate chips and oil in a large bowl and microwave them for 45 seconds until the chocolate is melted. Add the buttermilk, egg, sugar and cocoa powder to the chocolate mixture and whisk them well. In a small bowl mix the flour and baking powder, then fold them gently into the chocolate mixture. Divide the cake batter among the 4 ramekins, and divide the cocoa-sugar mixture sprinkling on top of the cake batter (about 2 heaping tablespoons per ramekin). Now carefully pour the boiling water ( 1/4 cup on each ramekin) onto of the overfilled mixture. Do not mix the layers at all. Place the baking sheet in the oven and bake for about 12 minutes until the cake rises to the top and looks set and cooked. It will puff a little and may deflate as it cools down -don’t worry if that happens! The mix of light brown and granulated white sugar makes for a rounder more caramelized flavor. Preparing dinner for two teenage boys tonight.. 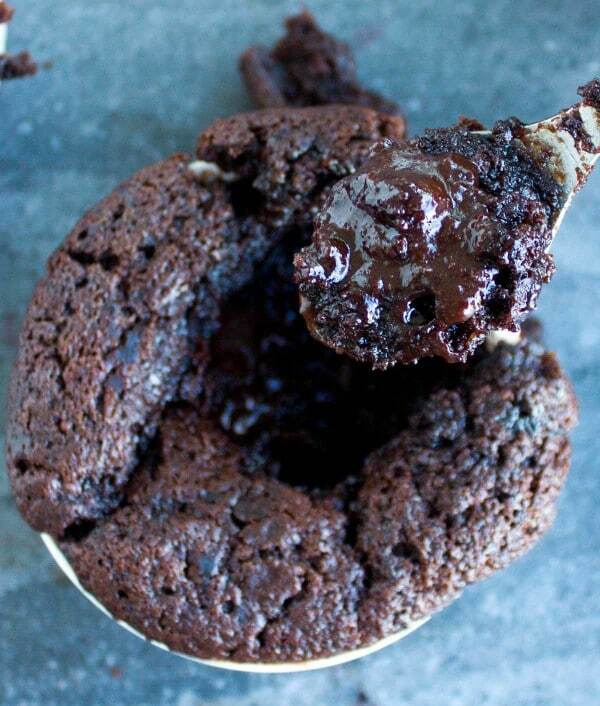 These Chocolate Pudding Cakes will be the star desert!!!! Where do you use the 1/3 cup of sugar listed near the top of the ingredients list? There is no cream cheese listed in the recipe list. I know this is over two years ago, but I just made this and realized as I was taking them out that there is 1/3 cup sugar in the ingredient list that isn’t used. I believe it’s supposed to be mixed into the chocolate chips at the beginning. Oh well. If it looks like it worked, I may remake them and just toss these out. When do you put in the 1/3 cup of sugar for the cake part of recipe? Would milk with a bit of vinegar work instead of buttermilk? Hi Mal, sorry I just fixed the instructions-the 1/3 cup of sugar int he cake part goes in with the egg. And yes you can totally substitute milk plus vinegar for the buttermilk, or even yogurt.